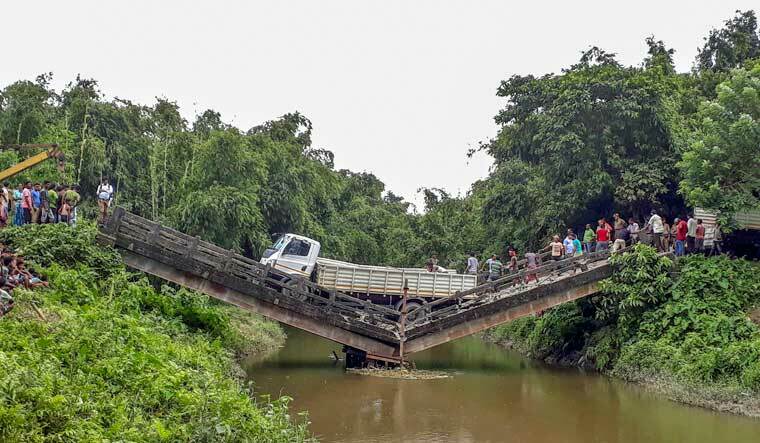 An old bridge collapsed near Siliguri in north Bengal on Friday, leaving a truck driver injured, a state minister said. This is the second incident of bridge collapse in West Bengal in three days. The Majerhat bridge had collapsed in south Kolkata on September 4, killing three persons and injuring 24. "Let the matter be inquired into," Governor Keshari Nath Tripathi told reporters in Kolkata when asked about the back-to-back collapse of the Majerhat bridge and the one today. North Bengal Development Minister Rabindranath Ghosh said movement of loaded trucks was banned on the bridge but many such vehicles bound for the north-eastern states continued to take it. "This incident is a result of that," he added. Ghosh also said the bridge was constructed long ago and its papers were not available. The repair work of the structure would be undertaken after the PWD prepared a report, he added. State Tourism Minister Gautam Deb said the bridge was maintained by the Siliguri Mahakuma Parishad (a sub-divisional body), run by the CPI(M)-led Left Front. "I will report to Chief Minister Mamata Banerjee," he added. Speaking to reporters in Kolkata, West Bengal CPI(M) state secretary Surya Kanta Mishra asked the ruling Trinamool Congress (TMC) in the state to "stop blaming others" for the collapse of the old bridges and instead, take steps for their repair and maintenance. "The Left Front, during its 34-year regime, constructed a lot of bridges and flyovers. Now, it is the duty of those who are in power to maintain and repair the bridges. Blaming others will not serve any purpose. The TMC is blaming others to divert attention from its failure," he said. "We had informed the state and the local administration that it needed to be repaired. But as it is a Left-run mahakuma parishad, funds were not released by the government," he told PTI.